Dozens of Gaza Arabs attempted to storm the border fence in southern Israel on Monday night. Dozens of Gaza Arabs stormed the border fence in southern Israel Monday night, attempting once again to break through to Israeli territory. IDF soldiers were able to keep the hordes back without incident. It was the fourth night in a row that groups of young Gaza Arabs attempted to enter Israel. Over the past several nights a number of Arabs were able to get over the border and infiltrate Israel. IDF troops apprehended them and returned most of them to Gaza. On Sunday, the heads of four regional councils in the Gaza Belt region called on Defense Minister Moshe Ya'alon (Likud) and Prime Minister Binyamin Netanyahu to immediately advance stalled plans to build a barricade the entire length of the Gaza border. 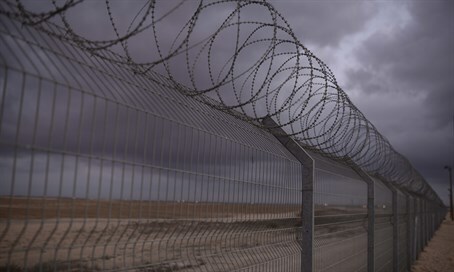 The local leaders, who represent the Sha'ar Hanegev, Eshkol, Sedot Negev and Hof Ashkelon regional councils, made the call after around 40 Gazans broke through the border fence on Saturday night amid rioting on the Gaza side, in a very palpable security threat. The call for upping the border fence comes even as terrorists in Gaza have been busily rebuilding their underground terror tunnel networks, and recently have stepped up rocket attacks after working to upgrade their domestic missile arsenal. The latest rocket attack came on Sunday night, and hit an open area of the Eshkol regional council. The IDF did not respond to that attack.